Exhibition of Soviet art and architecture opens at the Royal Academy of Arts. A model of Vladimir Tatlin’s planned 1920 “Monument to the Third International” currently dominates the courtyard of London’s Royal Academy. The spiraling steel and lopsided dynamism of Tatlin’s tower contrasts brilliantly with the symmetrical classicism and colonnaded façade of Burlington House. The project of recreating one of the symbols of the early Soviet era complements the RA’s exciting new exhibition of constructivist architecture, “Building the Revolution,” which runs until Jan. 22, 2012. The influence of French architect Le Corbusier is clear (in fact he built Moscow’s massive, red brick Union of Cooperatives pictured in the exhibition), but this was a time when Russia led the artistic world. Almost every modern and postmodern trend was anticipated during the years between the futurist and suprematist movements of the 1910s and Stalin’s rejection of constructivism in the 1930s. These early Soviet monuments were built to support post-revolutionary life: apartments for communal living, bakeries to cater to the masses and press offices to spread the good news. The RA’s celebration of the utilitarian elegance of these buildings is organized thematically by function with separate halls dedicated to communications, industry, health and housing. The exhibition includes vintage photographs from when these clubs and cafeterias, towers and turbine halls were first built, alongside Richard Pare’s images of the same structures seven decades later. Despite the fact that the selection tends to favor the aesthetic over the academic, it is clear how many of the buildings have suffered from neglect. 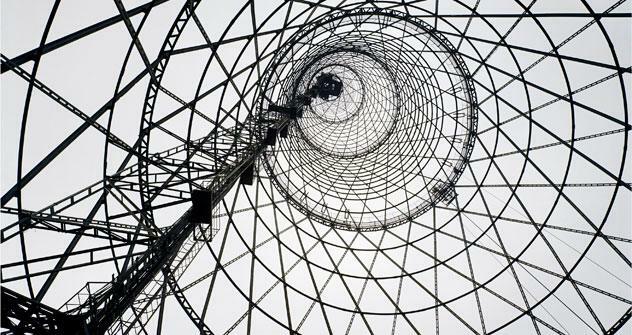 Pare’s poster-perfect captures are the largest and most striking images in the show: the mesmerising hyperboloids of Vladimir Shukhov’s Radio Tower or the light-filled studio of architect Konstantin Melnikov’s house; the Sochi sunset over the palm-planted Voroshilov Sanitorium or Lenin’s tomb on a crowd-free Red Square. Architectural expert and campaigner Clementine Cecil calls Melnikov’s house “an icon of modernist design and one of the most fascinating examples in the world of an architect’s own house.” Two interlocking cylinders with diamond shaped windows form an extraordinary space. Likewise, the Rusakov workers’ club, with its lotus-like petals echoing the shape of the auditoria inside is a lovely example of form and function in harmony. It is harder for a layperson to understand the value of a derelict factory or crumbling apartment block, especially as these works do not tend – in Cecil’s words – to “support the patina of age with grace.” This exhibition helps by setting them in an aesthetic context. The weak point of the exhibition – if there is one – is that the futurist paintings and drawings on show are only rather vaguely connected to the architecture in question. The geometric, modernist works, selected from the wonderful Kostakis collection in Thessaloniki, certainly form an appropriate background for the buildings photographed. Many of them also have suitable titles, like Lyubov Popova’s series, “Painterly Architectonics,” but co-curator MaryAnne Stevens’ promise to explore “the interplay between art and architecture during these heroic years” never really materializes. Stevens is forced to rely on such metaphorical links as “echoes,” “redolent of” or works being “set in dialogue with” each other. This vagueness scarcely detracts from the exhibition’s impact. In fact it reinforces the sense of a powerful, but impressionistic survey, underpinned by precise and original material from Moscow’s Shchusev Museum of Architecture.